Uncharted: The Lost Legacy (game, 2017). An action-adventure video game by Sony Interactive Entertainment LLC/SCEA. Developed by Naughty Dog LLC. Official Trailer. Uncharted: The Lost Legacy is an action-adventure video game by Sony Interactive Entertainment LLC and SCEA, developed by Naughty Dog LLC. 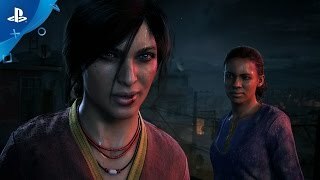 UNCHARTED: The Lost Legacy - PlayStation Experience 2016: Announce Trailer | PS4. 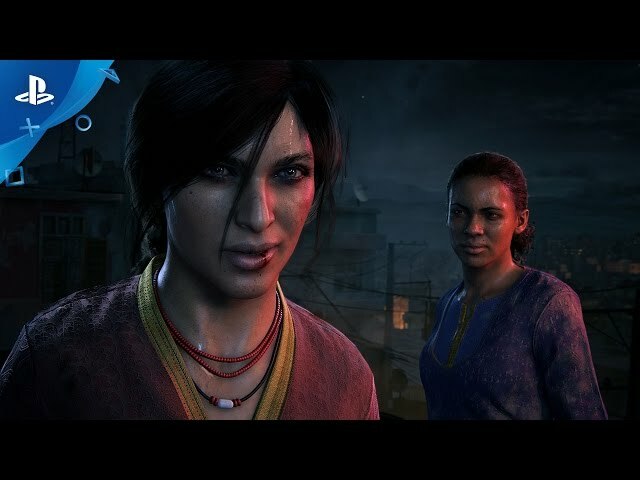 In India, treasure hunter Chloe Frazer searches for the legendary tusk of Ganesh, the son of Hindu god Shiva, who lost the tusk while defending his father's temple. Chloe's own father was killed by bandits while searching for the tusk. Chloe slips past insurgents and meets up with mercenary Nadine Ross. They sneak into the office of the insurgents' leader, Asav, who wants to use the tusk to rally India into a civil war. Chloe and Nadine steal a map pointing toward the tusk within the ancient Hoysala Empire and a disc that acts as a key. In India's Western Ghats, Chloe and Nadine follow the trail of several towers emblazoned with Hindu weapons: Ganesh's trident, Shiva's bow, and the axe of Parashurama, who used the axe to remove the tusk. The trail leads them to one of Hoysala's two capitals, Halebidu, whose last emperor left to be conquered by the Persians seemingly out of vanity. They realise the emperor left a false trail; the tusk is at the larger capital, Belur. On the way there, they escape Asav and his men, but lose the disc. While spying on Asav's forces, Nadine sees her old enemy Sam Drake, brother of Chloe's old friend and former partner Nathan Drake; she realizes he is Asav's expert. When she expresses her intention to kill Sam, Chloe reveals she was working with him before he was kidnapped. Angry, Nadine separates from Chloe, but they make amends. At Belur, they navigate several puzzles before being captured by Asav, who forces Chloe to use the disc to reveal the tusk. In the process, she discovers that Ganesh allowed Parashurama to cut off his tusk; as Shiva gave the axe to him, Ganesh did not want to shame his father by proving the axe useless. Asav triggers a trap and leaves Chloe, Nadine and Sam to drown. Chloe picks the locks on their handcuffs and they escape. Despite tensions between Nadine and Sam, the three chase after Asav to take back the tusk. Nadine is enraged to find that Asav is working with Shoreline, the mercenary group she used to run. Uncharted: The Lost Legacy is an action-adventure game played from a third-person perspective, with platform game elements. Players use firearms, melee combat, and stealth to defend against the hostile enemies. Players control Chloe Frazer - a treasure hunter who is physically adept and is able to jump, sprint, climb, swim, swing and perform other acrobatic actions. Players traverse several environments, moving through locations including towns, buildings, and temples to advance through the game's story. Players use firearms, melee combat, and stealth to defend against the hostile enemies. Players also drive vehicles during some gameplay segments. Uncharted: The Lost Legacy was scheduled to be released by Sony Interactive Entertainment LLC and SCEA on August 22, 2017 and on August 23, 2017.